Just say some words real quick and you’ll probably say one he coined – nearly 10% of his 20,000-word vocabulary was new to his audiences. You may consider yourself quite fashionable or softhearted. You may consider this post to be lackluster. But you couldn’t consider any of those things to be those ways if Shakespeare hadn’t made up the words for you. On November 25, 1864, actor John Wilkes Booth starred as Marc Antony alongside his brothers, Edwin as Brutus and Junius, Jr. as Cassius, in a one-night benefit performance of Julius Caesar at New York City’s Winter Garden Theatre — incidentally raising money to place a statue of Shakespeare on Central Park’s Literary Walk. Five months later, on April 14, 1865, JWB would put on a more impactful performance at Ford’s Theatre in Washington, DC, as a real-life Brutus, assassinating the leader of a nation. His statue in Central Park is covered in pigeon droppings, and strangely it's kind of his fault. (Yes, the same statue for which the Booth brothers’ benefit raised the funds). It's hard to believe that the veritable starling infestation of New York City came as the direct result of an innocent bird-lovin’, Bard-lovin’ pharmaceutical manufacturer named Eugene Schieffelin but, alas, ‘tis true. In March of 1860, Schieffelin released a mere sixty starlings into the Central Park air as a part of his effort to introduce every bird mentioned in Shakespeare to North America. Scientists estimate that the descendants of this and another small 1891 Schiefflin-released flock now number in the area of 200 million. Simpson, Biel and Rabbit, just to name a few. The name “Jessica” first appears in Shakespeare. The original Jessica was Shylock’s daughter in The Merchant of Venice. Shakespeare thought sexual repression was for the birds. His plays are bawdier than anything the Farrely Brothers have devised and, while his own rowdy Globe Theatre crowds ate it up (they were all drunk anyway), future generations found it necessary to censor the Bard substantially. Bell’s Shakespeare from 1773, the first collection of Shakespeare’s plays as they were performed on the English stage, contained only 2/3 of the original material. Those who want to see Romeo and Juliet as the embodiments of purity and love, like 18th-century English playwright David Garrick, are met with an imposing editorial task. Garrick’s first cut was the elimination of the character of Rosaline, the source of Romeo’s heartsickness at the play’s outset (she’s the one making his “sad hours seem long” in Act I, Scene 1) and one of many examples of the young man’s rash and impetuous teenage behavior. Apparently, people enjoyed the wishful notion of the purity and sensibility of teenage love, Garrick’s edited version of the play survived, unchanged, for over a hundred years. While it's difficult to categorize Shakespearean politics, it's easy to find justification of one’s own prejudices and beliefs in the Shakespeare canon. Many groups and movements have sought to claim him as their own. 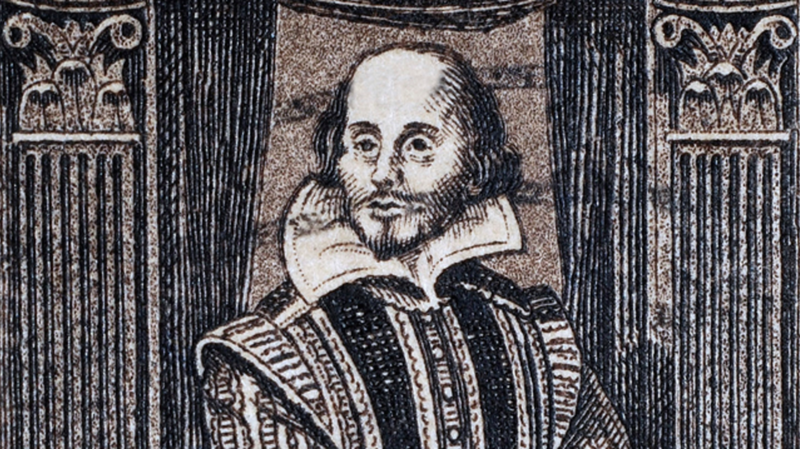 Shortly after Hitler became Chancellor of Germany, the Nazi Party issued a pamphlet entitled Shakespeare – A Germanic Writer. Three years later, during the height of Hitler's rule, there were more performances of Shakespeare’s works in Germany than the rest of the world combined. But those opposed to Hitler’s ideals could also find support in Shakespeare’s works, particularly in Shylock’s well-known speech from The Merchant of Venice. Just ask Paul Robeson - African-American actor, athlete, activist, and all-around rock star who, in 1943, played the role of Othello on Broadway. To this day, that show’s run of 296 shows is the longest ever for a Shakespeare play on Broadway. Big time. The works of the very-bearded Russian great aside, Shakespeare’s literary influence is immeasurable. Dickens and Keats credited nobody more. Eliot claimed that the modern world can essentially be divided into two categories: those things influenced by Shakespeare and those influenced by Dante. William Faulkner, Aldous Huxley, Vladimir Nabokov, and David Foster Wallace each titled one of their works directly from a line in Shakespeare. But perhaps the influence Shakespeare had on Tolstoy’s writing was even more profound, since Tolstoy wrote a whole book about his disdain for the Bard. Tolstoy on Shakespeare reveals, unequivocally, that Tolstoy did not merely lack delight in Shakespeare’s work, he derived from it, “irresistible repulsion and tedium” and found the literary world’s reliance on and reference for Shakespeare to be “a great evil – as is every untruth.” Yowza. And he did so years after his own death! Legend has it that a retired lush of a Bard stumbled under said tree – the crab variety – and slept off a night of competitive drinking with Bidford’s supposedly prolific booze hounds. Tourists tore the poor tree to shreds, taking home souvenirs of old Willy’s wild night. In the absence of any really reliable biography, we cling to legends and potentialities to help us understand anything at all about the man whose writing has helped us to understand so much. Marche reminds readers of the tantalizing fact that there are lost Shakespeare plays – two, at least, that scholars know existed but we have never had the pleasure of reading or seeing performed. One is Love’s Labors Won, the sequel to Titus Andronicus (just kidding). Love’s Labors Won is mentioned in two different sources, one being a bookseller’s list, meaning the play was likely in print at one time. The other is Cardenio, which scholars assume from the title is an adaptation of scenes from Don Quixote. 18th-century editor Lewis Theobald allegedly discovered a copy of this manuscript and developed his own play, The Double Falsehood, based on the manuscript. But he never showed the manuscript to anyone and lost it in a fire — either that or he made the whole thing up. Many scholars do believe, however, that The Double Falsehood does, indeed, contain elements of a play originally crafted by Shakespeare. If you want to celebrate the Bard's Birthday in style, don't forget you can up the Shakesperience with one of our Shakespeare Soiree Printable Party Kits!